Half-French and half-Chinese Singaporean, Mathias Camilleri was one of only five people to receive the prestigious Master Sommelier title in October 2017. This is no mean feat: currently, only 229 people worldwide hold this title. Camilleri joined Ce La Vi in May 2018, after carving a career in Paris and London. In the City of Lights, he graduated from the Lycee Albert de Mun with a Mention Complementaire Sommellerie. “Paris is one the main gastronomic cities in the world. This is where I grew professionally and learnt techniques from the people who mentored me,” he says. In 2012, he crossed the English Channel. As commis sommelier at The Vineyard at Stockcross – a country hotel outside London – he further honed his skills alongside master sommelier Yohann Jousselin. The following year, he moved to the British capital, joining the team at French fine dining restaurant Medlar in Chelsea. There, for the next three years, he was mentored by master sommelier Clement Robert. Camilleri was later appointed head sommelier at The Five Fields. The modern British restaurant picked up its first Michelin star in 2016. “In London, there is an incredible diversity of cultures from all around the world. I always make the parallel with the wine scene there. London is one of the most dynamic wine platforms in the world, with all the wine countries well represented. It is one of the top places to build your palate,” he says. He moved to Singapore to discover his heritage and explore the wider Asian region. How does it feel to be one of only a handful of people worldwide to be recognised as master sommelier? Achieving the master sommelier exam has been a long journey filled with doubts and sacrifices along the way. Passing the Master Sommelier exam felt like winning a gold medal in the Olympic Games. I started tasting wine at the age of 20/21. A Spatlese Riesling by Egon Muller opened the door to the world of wines for me, and ever since then, I haven’t been able to close it. What has been your most unforgettable wine experience so far? I had the chance to taste Mouton Rothschild 1945 while working in London. A group of customers organised an exclusive tasting of Bordeaux wines from the 1945 vintage, a historical year for France as it was the end of the second World War. Mouton stood out to me because of its freshness, and I could not believe that the wine could be 70 years old! It was one of the most incredible wines that I have ever tasted. What made you decide to return to Singapore and join Ce La Vi? 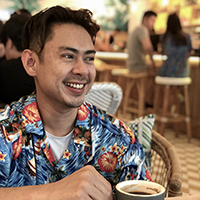 I was born and raised in Paris with a French father and a Singaporean mother, so Singapore has always been a destination that I wanted to explore deeper to get closer to my heritage. After spending 30 years in Europe, it felt like the perfect time for me to go to Asia. When Ce La Vi offered me the role of head sommelier, I was very excited to join the group! In fact, it was the ambitious challenge that I was looking for when I decided to leave London. How will you go about creating the wine list for Ce La Vi? What criteria/considerations will you apply? At Ce La Vi, we wanted to create a friendly wine list. With over 400 people from around the globe visiting us daily, our wine list is short with 200 carefully selected labels, classified by grapes and by prices. Hopefully, (we’ll) be able to please as many palates as possible. What interesting food-wine pairings have you made since joining Ce La Vi? Especially after the menu revamp? Ce La ViI’s food is influenced by lots of flavours from Asia, and every day I’m discovering something new. There are a lot of new flavours that I am still learning to master, but it is all leading to exciting combinations for the future. Currently, I am still at the experimental stage. What wines are on your radar at the moment, and why? At the moment, I really believe that Chinese wines are developing. The originality of the location, the quality of the wine produced and the unexplored lands make me think that China could be the next wine El Dorado in the next 10 to 20 years. What wines would you recommend wine-savvy but adventurous customers try? With regards to my previous answer, I would suggest some sparkling wine from China made by Chandon. It is a great example of the Chinese audacity blended with French savoir-faire. What’s in your personal wine collection? If we opened your wine fridge, what would we find? If you open my wine fridge, you will see a lot of the classics from Burgundy and the Loire Valley. There are also Italian wines, German Rieslings, some Champagne, but some more confidential and unusual bottles can be found too. Other than Ce La Vi, which other establishment(s) in Singapore do you think has an impressive wine list? There are two places I would recommend for anyone who loves wine. The first would be Madame Fan at JW Marriott. I recently met head sommelier Fabien Duboueix and he has created a very balanced selection of wines from all over the world, which nicely complements the Chinese food of Alan Yau. It was a mind-blowing experience. Secondly, it would be Atlas. As a Champagne lover, this is my must-go place in Singapore. The selection showcases all styles and great vintages of Champagne, all well selected by head sommelier Mason Ng, one of the most talented sommeliers I have had the pleasure of meeting in Singapore.